Tower Clocks - Many are for sale, make an offer! Welcome to my website whose purpose is to share my enthusiasm for preservation, restoration and collecting of specialized timepieces as well as dissemination of information about them. To use this site just click on the buttons at the top of the page to get the drop down menus to go to each horological sub-category or click on the pictures. Movie studios, TV film crews - we rent props! 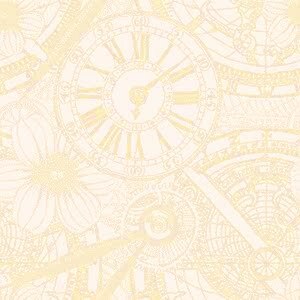 This website is divided into the three areas of horology that interest me. They are tower clocks (also known as turret clocks in the UK), skeleton clocks and bank vault time locks. The common theme is the fact that one can see the mechanism. 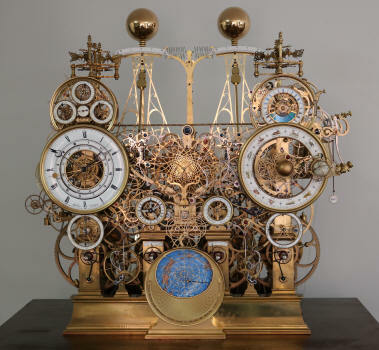 When these clocks are running, they become beautiful kinetic pieces of art. This is especially true at the scale demonstrated by the tower clocks. Another aspect of the collection is that it encompasses the full range of time movement sizes that a person might encounter in the world of horology. 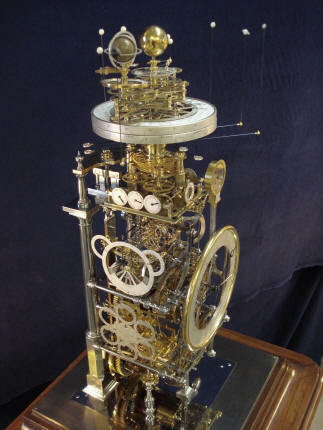 From a few ounces and an inch or so across - the size of a pocket watch, to over a one-half ton, 6 foot wide tower clock. The oldest clock is from the late 1400's and the newest is now under construction. I also enjoy the restoration of time pieces, in particular, tower clocks. 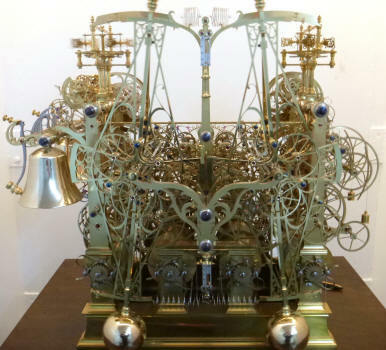 There is something very satisfying in bringing an ugly, rusted piece of machinery back to life as a beautiful kinetic sculpture. The Restorations button goes through a typical restoration process for tower, skeleton and time locks. One will get a sense of how labor intensive (labor of love?) this process can be. I've written papers on tower clocks and the Westminster clock. A discussion on remontoire along with visual aids can all be accessed through the Other Items button. 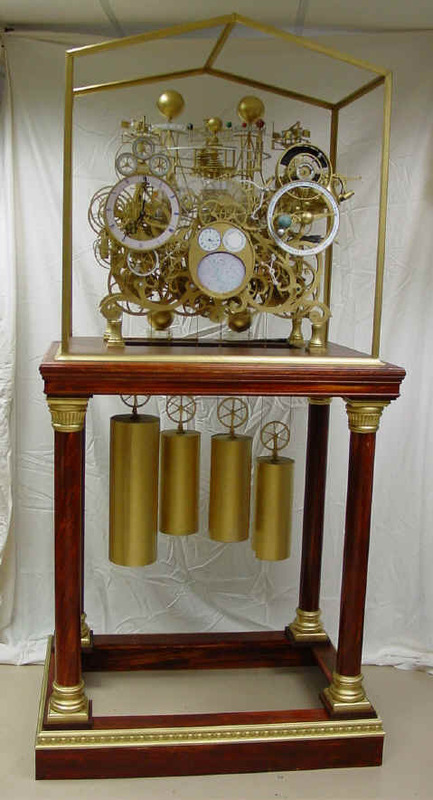 Below is a commission, to my design, to have a large, complex astronomical clock built over the next several years; it was begun in January 2006 and can be seen under the Astro skeleton button, above. Details are here as well as in the August 2007 and April 2011 issues of the National Association of Watch and Clock Collectors Bulletin. A synopsis of the project through August 2010. Watch the construction as it progresses. A library of videos in connection with this project can be viewed on my YouTube channel: http://www.youtube.com/user/fgtyc?feature=mhee . Left, original mockup in wood, July 2006. Next, clock construction as of August 2011. Interested in selling or a trade? Please contact me. The site is graphics intensive and is best enjoyed with a high speed internet connection. Video clips will play automatically as an extension of films from my YouTube library or on Windows Media Player or RealOne Player, under Internet Explorer. Any questions, comments, suggestions email me: mfrank1@rcn.com. Member of: National Association of Watch and Clock Collectors (NAWCC), NAWCC Chicago Chapter #3, NAWCC Tower Clock Chapter #134, British Horological Institute (BHI), Antiquarian Horological Society (AHS). For more information about these organizations and other sites of interest click LINKS page. This site and all its contents, are copyright © 2018 by Mark Frank. All rights reserved. Read papers on the history of tower clocks. The accident in 1976 to the clock at Westminster (Big Ben). 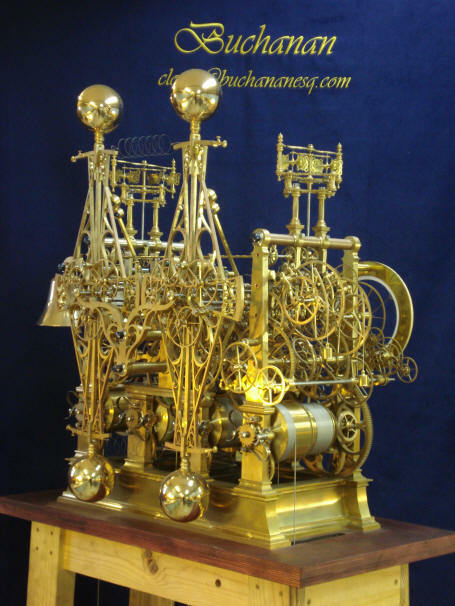 The theory and applications of remontoire.